Dragonfire Active Strat Alnico pickups are SA Series Alnico 5 Magnet style pickups for the single coil swagger and down-n-dirty progressive sound you want without all the noise. The Alnico magnets featured in these pickups offer warm tones for a smoother modern effect to help you achieve an intense yet clean performance. Active Strat pickups work great for any Strat set-up and are perfect for blues, rock, country and any other genre that would benefit from the famous tone and power that only active pickups can deliver. Blues and rock players can really amp up sustain, power and performance with these pickups. These pickups are interchangeable and can work in any position to give you flexible installation and play options. Includes Quik-Connect 3-Pin style wire leads and battery clip for easier installation (soldering required). Enjoy a slick, sleek and clean look with these covered style pickups for a modern appearance without any exposed poles or rails. ACTIVE pickups require a 9v battery (not included). Due to the vast and varied nature of possible set-ups, we do not provide specific information, instructions or diagrams for installation. You should be able to use basic knowledge of wiring with the diagram or instructions of your choice. Installation requires soldering and compatible system. We provide enough pickup lead wire to complete installation wiring in standard usage situations. Use only the provided pickup connection cables. 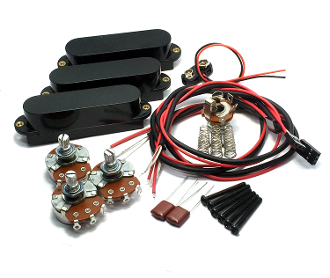 Though these pickups work well with EMG systems, they will not work with EMG style cables. Take your time for installation; do not use power tools and do not over-tighten or apply too much pressure on components.